High school science teachers from the Dundee Central School District in Dundee, NY will spend the next two years with scientists from Cornell University in Ithaca, NY, developing and enhancing laboratory investigations that they can then pass on to their own students. The first Xraise Science Teacher Workshop took place September 27 at Cornell as part of an outreach program of the Cornell Laboratory for Accelerator-Based Sciences and Education (CLASSE). That first session, held at the eXploration station behind the Wilson Synchrotron Laboratory on the Cornell campus, included a keynote by Ernie Fontes, associate director of the Cornell High Energy Synchrotron Source, who encouraged the teachers to evoke their students' sense of curiosity, creativity and wonder about science. Then Tom Hartman, a physics assistant professor, talked about his research on quantum gravity and quantum field theory before teachers did some lab experiments on the subject, all with the intention of passing on what they learned to their students back at Dundee. "The students will love the relativity aspect of how muons make it to the Earth's surface," said Jim Greenhall, a high school teacher from Poughkeepsie, NY. 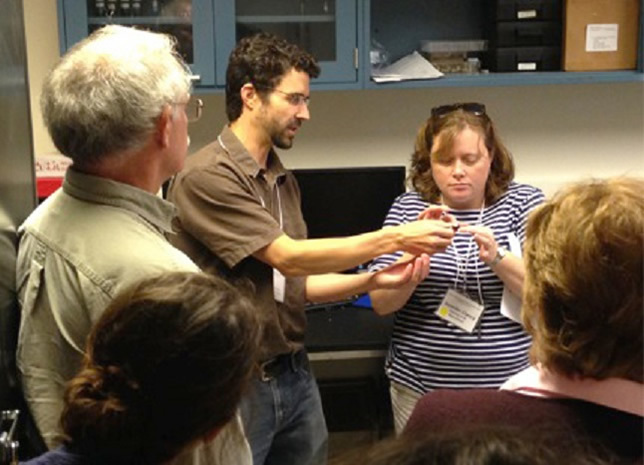 The high school teachers also learned about crystallography techniques, atomic force microscopy and X-ray fluorescence during their visit to the Wilson Lab facility. The Xraise Science Teacher Workshop program, funded by a National Science Foundation grant, will allow teachers to spend about 90 hours over the next two years to develop programs at their own schools to increase their students' academic achievement. "We at Xraise are looking forward to working with the Dundee science teachers to develop curriculum materials that that tie into the science of Wilson Lab and, at the same time, tie into the New York state learning standards," said Eva Luna, CLASSE teaching support specialist.